In hindsight, Jean-Louis Schlesser's F1 career has been a rather silly affair. This is of course predominantly due to his contre-temps with a pretty famous driver leading a pretty famous race in front of a crowd that welcomed his act of foolishness as a God-sent gift. The misunderstanding between the driver of the remaining McLaren car, out in front with an unassailable lead over the home favourites, and the replacement driver trying to do his best to keep out of the way has gone into history as the move that quashed McLaren's hopes of a complete season wipe-out. Impartial viewers and tifosi alike chuckled at the mix-up that ended in the Rettifilio sandtraps, however, for the evil McLaren empire had ruined the 1988 season with an unbroken string of rather tedious victories. So, instead for being known across the globe as the 1989 and 1990 World Sports-Prototype Champion for Sauber Jean-Louis is best remembered as the clumsy backmarker who punted Ayrton Senna out of the lead in the 1988 Italian GP. But the proceedings in Schlesser's only GP race - he failed to qualify five years earlier in a one-off with the hopeless RAM and replaced Mansell's replacement Martin Brundle for Monza '88 - do not reflect well on his consummate skill. The nephew of sixties sportscar ace Jo Schlesser (whose initials 'JS' were adopted by Guy Ligier for all of his F1 designs) did rather well to follow in his uncle's footsteps. It was certainly not the intention of the young Jean-Louis, though, who was eager to make his mark in single-seaters. But after modest luck in French F3 things didn't go his way, Jean-Louis moving over to touring cars and sportscars. He excelled in the latter type, first with Silk Cut Jaguar, then with Kouros Sauber. Today, J-LS is still active in an altogether different line of motorsport, driving his own buggies in desert rally raids. Shortly after this photo was taken, Jean-Louis Schlesser was to become an honourary Italian! To set the scene, this is the Italian Grand Prix of 1988. Enzo Ferrari has passed away 2 weeks prior to the event. McLaren have won every single race up to this one. The tifosi have come to the race praying for some miraculous happening that will allow a scarlet car to cross the line first but they know in their hearts that there is no reason to suggest that the McLaren steamroller will falter. Maybe they figure that since Enzo is now at the great racetrack in the sky, he can pull a few strings and organise a Ferrari victory. Enter Jean-Louis Schlesser. He is replacing an ill Nigel Mansell who also missed the Belgian GP with Martin Brundle subbing. Martin cannot fill in for Nige at the Italian race due to sportscar race commitments. 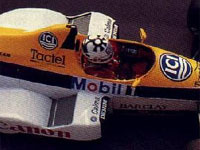 At the last moment, it is arranged for former test driver, Schlesser to drive the Williams (in its first year without Turbos) and he qualifies 22nd. The race begins, and as expected, the McLaren of Senna heads off into the distance. Good driving and attrition see the two Ferraris filling 2nd and 3rd late in the race. On lap 49 of 51, Senna comes up to lap Schlesser who appears completely unaware that he is there. Senna dives inside the Williams at the entrance to a chicane but Schlesser comes across him - contact - and Senna spins into retirement. The two Ferraris sweep across the finish line 1-2 and the whole of Italy gives thanks to Mr Schlesser, who makes a tearful apology to Senna after being classified as finishing 11th. Ron Dennis' dreams of winning all 16 races with his McLaren team go up in smoke. Jean-Louis was the nephew of Jo Schlesser, also a grand prix driver and a great friend of Guy Ligier's. Jo was tragically killed in the wet French Grand Prix of 1968 and Guy’s Ligier racecar designations always began with JS in his memory. Jean-Louis began motor racing moving into Formula 3. He attempted to make the cut at the 1983 French GP in a RAM but was unsuccessful. He put his F1 aspirations (apart from testing with Williams) on hold and went sportscar racing with Jaguar. He was World Sportscar Champ in 1989 and 1990. He still races and last year entered his own racing buggy in the Granada to Dakar off road rally.